The second installation is at Lixil's eco-homebuilding franchise Eyeful Home Company's health room. Here Verbatim installed 29 panels (all 2nd-Gen ones). 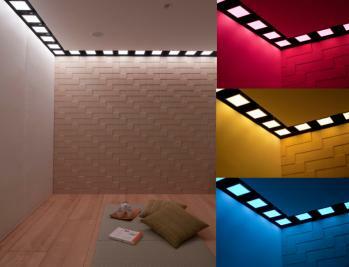 The 2nd-gen Velve panels (announced in May 2012) are color-tunable and offer a brightness of 2,000 cd/m2. They come in two sizes (although Verbatim can also create custom-made OLED panel sizes): 131x44 mm and 65x72 mm. The depth is just 5 mm and each panel weighs 193 grams. The Velve OLED lighting panels are made together by Mitsubishi and Pioneer. Verbatim already announced the third-gen panels that offer increased efficiency (51.6 lm/W). Other than that they seem identical to the 2nd gen panels (but they come in just one size: square, 123x123 mm active area). In July 2012 we posted a hands-on review of Verbatim's first-gen Velve panels.